Not All Those Who Wander Are Lost: Love of animals . . . . . .
My two are certainly 'chips off the old blocks' when it comes to being animal lovers. Taking you back in time a bit with this photo to the early 80s. 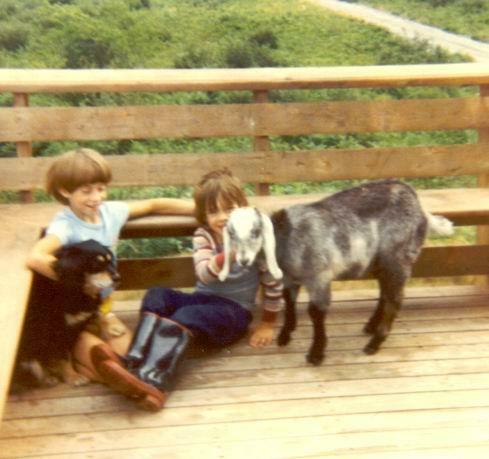 My children with two of their favourite friends and playmates . . . . . . Pepper, the neutered Nubian male goat and Missy, the part Cavalier King Charles Spaniel that my DH 'adopted' from the Dog Pound in Halifax. Both were wonderful pets and much loved and enjoyed by all our family members. I have always been so thankful that we were able to have various animals at different stages in our lives, for I truly believe every child should grow up being exposed to animals and the lessons they can teach us.